As it entered the 1960s, American institutional psychiatry was thriving, with a high percentage of medical students choosing the field. But after Thomas S. Szasz published his masterwork in 1961, The Myth of Mental Illness, the psychiatric world was thrown into chaos. Szasz enlightened the world about what he called the “myth of mental illness.” His point was not that no one is mentally ill, or that people labeled as mentally ill do not exist. Instead he believed that diagnosing people as mentally ill was inconsistent with the rules governing pathology and the classification of disease. He asserted that the diagnosis of mental illness is a type of social control, not medical science. 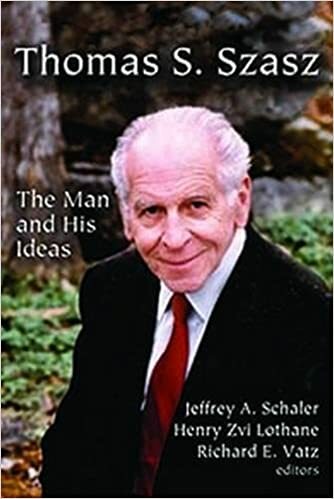 The editors were uniquely close to Szasz, and here they gather, for the first time, a group of their peers―experts on psychiatry, psychology, rhetoric, and semiotics―to elucidate Szasz’s body of work. Thomas S. Szasz: The Man and His Ideas examines his work and legacy, including new material on the man himself and the seeds he planted. They discuss Szasz’s impact on their thinking about the distinction between physical and mental illness, addiction, the insanity plea, schizophrenia, and implications for individual freedom and responsibility. This important volume offers insight into and understanding of a man whose ideas were far beyond his time. Not exactly easy reading (I think a change in the type and/or size of font would have helped) and not the most “efficient” (for want of a better word) way to learn about Szasz & his ideas. But there is gold here for those who can dig it out. And also, this book was/is a labor of love on the part of the authors. I especially liked chapter 5 “What Follows from the Nonexistence of Mental Illness?” Changing the wording from “Mental Illness” to “Problems with Living” was, for me, much more than a matter of semantics- it completely changes a label (“Mental Illness”) seemingly designed to stop further thought/inquiry (much like the term “homeless”) into something which tends to compel further (and original) thinking.